Savoia-Marchetti manufactured the wings, undercarriage and engine installation, while FFA manufactured the fuselage, tail and controls, while both companies had assembly plants manufacturing the complete aircraft. The first Swiss model flew on 9 March 1969, the first Italian aircraft following on 8 May. Bravo is a rugged all-metal low-wing monoplane with a full vision canopy. Its tricycle landing gear is fixed. 34 15s and 180 18s were built, with most in service with military customers. The biggest civil operator is Patria Pilot Training at Helsinki-Malmi Airport, Finland. With 180 hp Lycoming AEIO-360-B1F engine, constant speed propeller, third aft seat, fully aerobatic. With 195 kW (260hp) Lycoming AEIO-540 engine. Only one aircraft manufactured so far. 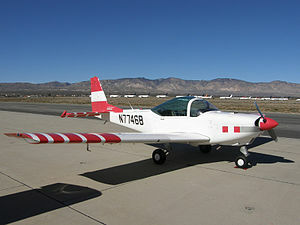 Two-seat tandem trainer aircraft, powered by a 268 kW (360-hp) Allison 250-B17C turboprop engine. Only one aircraft manufactured. Patria Pilot Training - 7 aircraft. Patria's Bravos are ex-British Aerospace Flying College aircraft. BAE Flying College owned 11 aircraft, but 1 was lost in Scotland claiming 2 lives. Remaining 10 aircraft were sold to private Finnish flying school Pilot Factory, which merged with Patria in 2004-2005. 7 aircraft out of original 10 remain in service. During merger with Patria, one aircraft was sold to private owner. Night-time accident at Helsinki-Malmi airport in 2002 claimed no lives but hull was damaged beyond repair. In August 2010 one aircraft veered off the runway at Helsinki-Malmi and was written off. Royal Air Maroc - 5 aircraft. Royal Flight of Oman - 4 aircraft. Uganda Central Flying School - 8 aircraft. Indonesian Air Force - 40 aircraft. Iraqi Air Force - 48 aircraft. Royal Moroccan Air Force - 10 aircraft.